Most lasers have only one color. All the photons it emits have exactly the same wavelength. However, there are also lasers whose light is more complicated. If it consists of many different frequencies, with equal intervals in between, just like the teeth of a comb, it is referred to as a “frequency comb”. Frequency combs are perfect for detecting a variety of chemical substances. 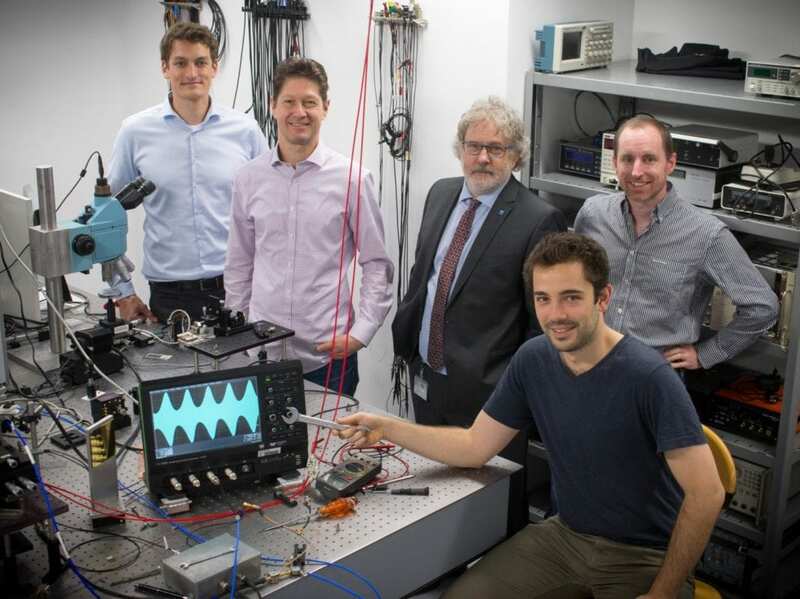 At TU Wien (Vienna), this special type of laser light is now used to enable chemical analysis on tiny spaces – it is a millimeter-format chemistry lab. With this new patent-pending technology, frequency combs can be created on a single chip in a very simple and robust manner. This work has now been presented in the journal “Nature Photonics“. At the Vienna University of Technology, frequency combs are produced with quantum cascade lasers. These special lasers are semiconductor structures that consist of many different layers. When electrical current is sent through the structure, the laser emits light in the infrared range. The properties of the light can be controlled by tuning the geometry of the layer structure. “With the help of an electrical signal of a specific frequency, we can control our quantum cascade lasers and make them emit a series of light frequencies, which are all coupled together,” says Johannes Hillbrand, first author of the publication. The phenomenon is reminiscent of swings on a rocking frame – instead of pushing individual swings, one can make the scaffolding wobble at the right frequency, causing all the swings to oscillate in certain coupled patterns. “The big advantage of our technology is the robustness of the frequency comb,” says Benedikt Schwarz. Without this technique, the lasers are extremely sensitive to disturbances, which are unavoidable outside the lab – such as temperature fluctuations, or reflections that send some of the light back into the laser. “Our technology can be realized with very little effort and is therefore perfect for practical applications even in difficult environments. Basically, the components we need can be found in every mobile phone”, says Schwarz. This results in spectacular application ideas: one could place the chip on a drone and measure air pollutants. Chips glued to the wall could search for traces of explosive substances in buildings. The chips could be used in medical equipment to detect diseases by analyzing chemicals in the respiratory air. The new technology has already been patented. “Other research teams are already highly interested in our system. We hope that it will soon be used not only in academic research, but also in everyday applications, “says Benedikt Schwarz.